Ori Gersht, a long time resident of London, has returned to his home town Tel Aviv with two interconnecting shows that reflect his outstanding ability to portray themes of life, death, beauty and violence. Spiritual devotion is part of his ritual. 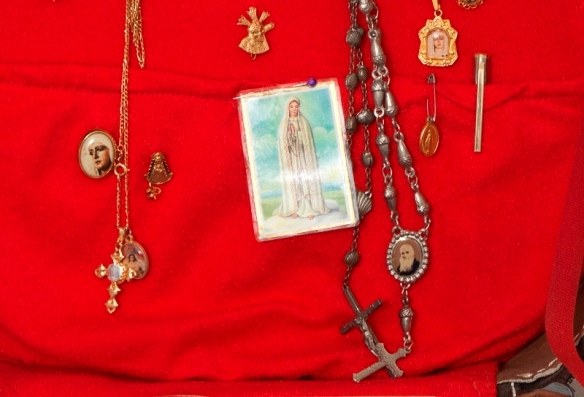 Before leaving the room, the bullfighter turns to pray to a portable altar that contains religious artifacts – medals, crosses, and a picture of La Macerena, the patron saint of bullfighters. Some of them he hangs round his neck. After the fight he is shown returning to his room taking off his costume, storing it away, and putting on everyday clothes. He then shuts the case, and takes it with away with him. The fight itself is never shown, only alluded to in a dream scene where bull and matador face each other in an empty arena, their figures partially obscured by clouds of dust rising from the ground. The camera also pans the length of empty holding cells into which bulls are herded prior to being let loose in the ring. The walls are scratched and bloodied, and one can well imagine the animals’ frantic efforts to escape from confinement. 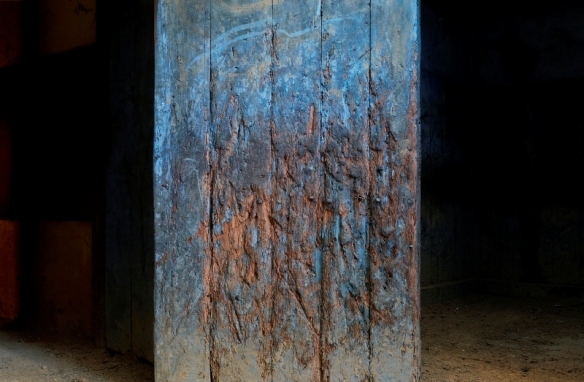 Gersht has isolated one wooden section of a pen, reproducing it as a print in various colors so that this evidence of suffering is converted into an abstract composition. Over the years many of Gersht’s films and photos have focused on peaceful landscapes that have tragic associations. For instance, a series depicting cherry blossoms growing in contaminated soil at Hiroshima (2010), or Forest (2005) filmed in Kosov, Poland (present day Kosiv, Ukraine) where more than 2,000 Jews were murdered in 1940 and buried in a mass grave. Will You Dance With Me? , one of the films selected for screening in Tel Aviv relates to a traumatic event that remains etched in the memory of Yehudit Arnon, a prisoner in Auschwitz, who was forced to stand barefooted in the snow for a whole night for refusing to dance for a Nazi officer. At the time, she vowed that if she survived she would dedicate her life to dance. This she did, founding the Kibbutz Contemporary Dance Company which attracted international attention. 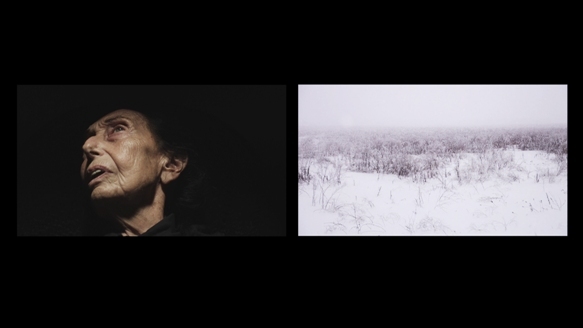 In this two-channel video, a wintery, quite beautiful, landscape is shown simultaneously with close-up views of Arnon, then 85 years old, her almost skull-like face drifting into the light and then receding into darkness. At one point she raises her hand to her head in a gesture that commands attention and reminds us that she was once a great performer and teacher. This film can be interpreted on several levels, but not least as a moving portrait of old age when the body is failing but there is still evidence of an indomitable spirit. Liquid Assets, a film commissioned by the Museum of Fine Arts in Boston where Gersht held a mid-career survey in 2012, moves to a new but allied subject, creation and destruction: man’s work destroyed by the ravages of Nature and time. But the memory remains. 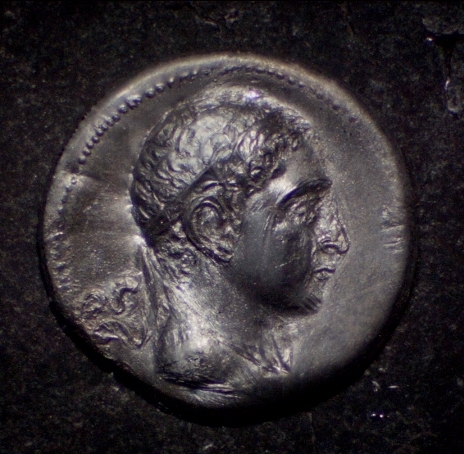 Featured is an ancient Greek coin from the Museum’s collection that depicts the profile of Euthydemus II, king of Bactria. Pierced by flames, this metal disc begins to ripple and twist as it starts to melt. But the head of the king can still be seen right up to the moment that the coin disintegrates and disappears from sight. As in many of Gersht’s works, beauty, violence, memory and history collide here in a visually exciting way. Two highly recommended shows that should be viewed in tandem. Read more about Yehudit Arnon (October 15, 1926 – August 17, 2013) at the Jewish Women’s Archive.